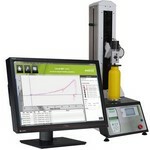 For measurements of texture, consistency, firmness ANDILOG developed an automated penetrometer. The TEXTOR III is an automated single column measuring equipment, testing in compression and tension; it can also perform up to 255 cycle tests. The TEXTOR III is a motor driven tester,which allows to test the sample under a steady rate while measuring the load applied in compression. By measuring the force at the maximum distance of a compression cycle (i.e. puncture test on butter) and the maximum force reached prior to a fracture (i.e. biscuit break or puncture through skin of a vegetable), our model is able to characterize the firmness and the texture on substance. The TEXTOR III model is also able to specify the stiffness of material (known as the elasticity calculation). It's the perfect material testing instrument for all your quality control in laboratory, and thanks to its probe and software it’s a ready to install solution. In addition, a wide range of penetrators (cylinders, cones, plates, spheres, needles) and sensors are available to meet the requirements of different types of semi-solid substances: food, waxes, paste or cream. Operating principle: Andilog’s TEXTOR III penetrometer is dedicated to measure the applied force by the probe on your sample (i.e., food, cosmetics, chemical and other semi-solid materials), measuring the consistency (i.e., firmness) and depth. Simple to operate: The probe is mounted to the Force load cell and the test start by pressing one button. The force is applied to the substance and the TEXTOR III measures, records and displays in real time the graph and result in Newton, Kg or Lbs units.